On paper, The Commune sounds like a potentially great idea. Director Thomas Vinterberg’s career can charitably be described as erratic—anyone still dimly recall It’s All About Love, a sci-fi romance starring Joaquin Phoenix, Claire Danes, and Sean Penn?—but his one undisputed triumph, 1998’s The Celebration, deftly orchestrated chaos within a large ensemble cast. Communal living ought to be right up his alley. What’s more, it turns out that Vinterberg actually grew up in a Danish commune and based the screenplay (co-written with Tobias Lindholm, one of the creators of Borgen), at least in part, on his own childhood memories. So it’s doubly bizarre that The Commune all but ignores its ostensible subject. Rather than portray a turbulent group dynamic, the film focuses on the marital woes of one particular couple, squandering its novel milieu on a banal conflict that would play out similarly in just about any context. It begins promisingly enough. Sometime in what looks to be either the late ’70s or early ’80s (Vinterberg was born in 1969), college professor Erik (Ulrich Thomsen) inherits his parents’ enormous house, which constitutes far more square footage than his nuclear family—just wife Anna (Trine Dyrholm), a TV-news anchor, and their teen daughter, Freja (Martha Sofie Wallstrøm Hansen)—would ever possibly need. Erik’s natural impulse is to sell the place, but Anna, who’s feeling vaguely restless, suggests another idea: fill the many spare rooms with friends—and, if necessary, with some cool-seeming strangers as well. Rules are drawn up, votes are held, bonding exercises commence (the whole gang goes skinny-dipping in the ocean, a scene bluntly set to The Who’s “Join Together”), and before very long, nerves inevitably begin to fray. Trouble is, the primary source of tension has little to do with numerous people sharing close quarters. Erik, who’s in his 50s, falls in love with a student, Emma (Helene Reingaard Neumann), who’s maybe half his age. That’s just about the oldest story going, and the sole novelty here is Erik’s decision to invite Emma to join the commune, and Anna’s corresponding decision not to oppose Emma’s presence in the house. Will this prove to be a toxic environment? 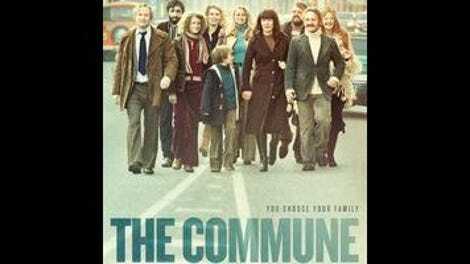 Indeed it will, and The Commune rarely avoids the obvious as it chronicles the emotional fallout. The two leads are terrific actors (both of whom have worked with Vinterberg multiple times, including in The Celebration), and Dyrholm beautifully captures the mind-set of a woman who’s fiercely determined not to come across as judgmental or small-minded, even at the expense of her own happiness and well-being. But Thomsen can’t do much with Erik’s generic midlife crisis, and the problems involved in a separated couple cohabiting with the husband’s new, much younger lover are so fundamental that they’re just not dramatically compelling. Oh, is that not a good idea? What a shocker. Meanwhile, the rest of the commune members—some of whom make a strong impression early on—gradually fall by the wayside. Apart from a maudlin subplot involving another couple’s ailing son, which pops up every so often in a fairly transparent effort to set up the movie’s climax, there’s little effort to integrate the supporting cast with the central love triangle; everyone else is around merely to justify Emma being around, as a commune is the only plausible reason for her to be in the same house as Anna. Vinterberg doesn’t even seem especially interested in conveying what it was like to share his home with a gaggle of non-relatives (though the neat freak who keeps designating other people’s stray belongings as garbage and setting them on fire must have been taken from real life). For some reason, he’d rather serve up yet another middle-aged man who throws his wife over for a Kewpie doll. Shoving the three of them into the same large building with some glorified extras can’t single-handedly make that scenario less stale.